Scrollbar allows you to create a scrolling bar that you can select a value from a range of values. The Scrollbar can generate adjustment event. To receive the event, the application must implement AdjustmentListener interface and register the listener by using the addAdjustmentListener(AdjustmentListener listener) method. creates a new vertical scrolling bar. creates a new scrolling bar with specified orientation. 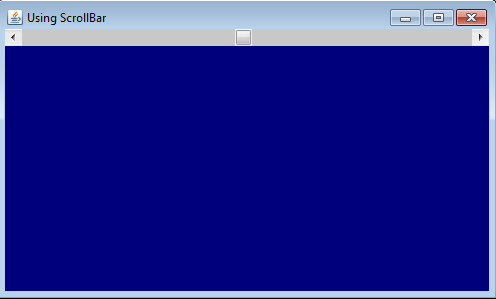 The orientation can be Scrollbar.HORIZONTAL or Scrollbar.VERTICAL. creates a new scrolling bar with specified orientation, initial value, visible amount, minimum and maximum values. reads the maximum value of the scrolling bar. reads the minimum value of the scrolling bar. reads the value of the scrolling bar. sets the block increment of the scrolling bar. sets the maximum value of the scrolling bar. sets the minimum value of the scrolling bar. sets the unit increment of the scrolling bar. sets the value of the scrolling bar.